Yarrow is a plant many of us welcome into our gardens without really knowing the depth and breadth of her true personality. She’s been around for centuries, used on battlefields of old to staunch many a bleeding wound from sword or axe. She has an affinity with blood, strengthening vessels and tightening tissues as well as eliminating waste and toxins through the skin and the kidneys. She’s a tough old bird, loving the dry and sunny conditions. In fact this is when she is at her strongest, the active ingredients and volatile oils she produces at their peak. She is best harvested in Summer when her blooms are full. Cut a few long stalks with leaves and flowers intact and hang inside to dry. Next time you are feeling a bit off colour or in the early stages of a cold or the flu make a brew from your dried yarrow. By having some close at hand you are so much more likely to remember these simple remedies in a time of need. Instead of a bathroom cupboard stocked with pharma drugs why not start another sort of collection. Gather a few different healing plants and hang to dry. Start with one or two, and add to them as your knowledge grows. For more details read the full post. White yarrow flowering by the door of my whare rongoa. The disc flowers are growing fat with seed. Description; the name Yarrow applies roughly to over 80 species of plants. Here we are discussing specifically achillea millefolium which is an herbaceous, perennial plant. The fibrous rhizomes produce a rosette of long and feathery leaves, which can grow between 5-20cms long and up to 5cms wide. This is followed in Spring by one or two rough, angular stems which can grow up to one metre in height. Hairy leaves are distributed spiral fashion along the stem, being larger towards the lower half of the stem. Miniature daisy-like flowers appear in flat-topped clusters atop the erect stems. Each individual flower spans roughly half a centimetre in width and is made of 5 ray flowers. These encircle a cluster of disk flowers. The flowers range through from white to pink. The whole plant has a sharp, pungent though pleasant woody aroma. Parts used; stems, leaves and flowering tops. Preparations; fresh/dried plant, poultices/compresses, tinctures/extracts, essential oils/aromatherapy, balms/ointments/salves, homeopathic remedy, tea/tisane, capsules/powders. When making teas or tisanes from medicinal plants always make sure you have correctly identified the plant. As a general rule you can use 1-2 tsp dried material to 1 cup of hot water. If using fresh you may use a little more of the plant material. One cup of the tea daily should be sufficient unless you are in an acute situation and then you may prefer to have 2 or 3 cups daily for a few days. When using medicine plants we don’t need to bombard our bodies with them. Have a cup or two and see how you feel. Start to tune in to your responses. Our mind/body is the real healer oftentimes needing just a little trip start to health and wellness. Habitat; yarrow is indigenous to Europe and Asia, though it has successfully naturalized world-wide. It may be seen along road-sides, pastures, in old cultivated fields or gardens. Yarrow does best in well-drained soil and a sunny position, withstands droughts but will survive in damp and shady spots. It has the ability to displace desirable vegetation through it’s rapidly spreading rhizomes/roots and seeds. 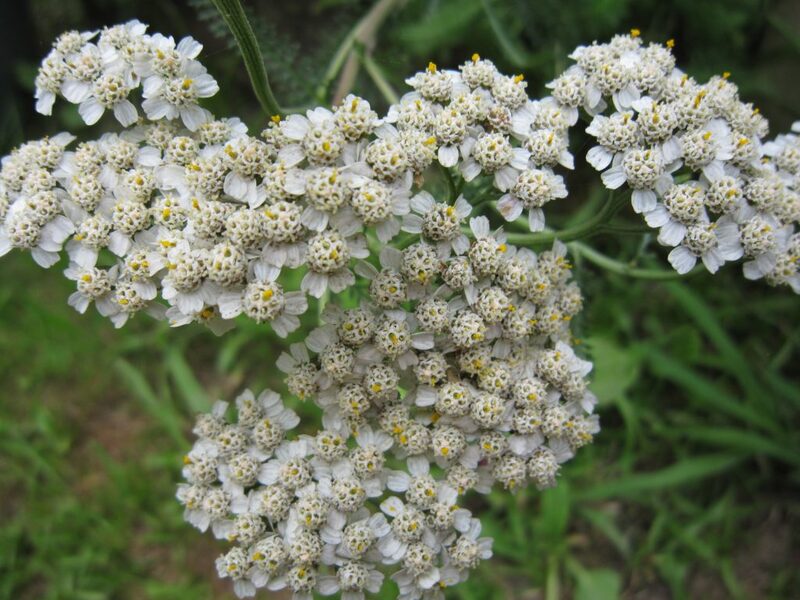 Traditional and Historical uses; the Ancient Greeks used yarrow on the battlefield to staunch bleeding wounds. It’s name achillea is thought to come from the hero of greek legends Achilles who used the plant to staunch his wound. Many different Native American Indian tribes used yarrow. It is ranked as one of their most useful and important herbs. To name but a few uses; antinflammatory for joint and rheumatic pain, sciatica, tooth-ache, head-aches, ear pain, for bites and stings, wounds, internal and external bleeding, burns and boils, nose bleeds, as a general tonic, for colds and influenza, eye infections, as an insect repellent, and a deodorant. In Ayurvedic medicine yarrow is used for the respiratory, digestive and circulatory systems. Dr Christopher lists yarrow as one of his 10 most important herbs, particularly for it’s diaphoretic (sweat inducing) properties. He suggests it’s use for fevers, eruptive diseases (measles, chicken pox etc) haemorrhage of lungs and bowels, bladder disorders, diarrhoea, dysentry, typhoid fever, diabetes, piles, rheumatism to name but a few. Therapeutic actions; antiseptic, antioxidant, antimicrobial, analgesic, vasodilator, astringent, vulnerary, haemostatic, vasodilator, carminative, hepatoprotective, antispasmodic, emmenagogue, anti-inflammatory, digestive, diuretic, diaphoretic. Constituents; as many as 82 constituents have been identified in yarrow; Some of these include; sterols, monoterpenes, triterpines,sesquiterpene lactones, a-pinene, b-pinene, limonene, sabinene, flavonoids, achilleine, camphor, azulenes, caryophyllene, caffeic acid, chlorogenic acid, salicylic acid. Current herbal uses; Externally; wounds, bleeding wounds, nosebleeds, haemorrhoids & varicose veins. Internally; excessive menstruation & dysmenorrhoea, PMT, irregular menses. Gastrointestinal complaints such as indigestion, heartburn, reflux, irritable bowel, chronic diarrhoea, ucerative colitis and lack of appetite. As a digestive tonic. At the onset of colds, influenza and fevers take yarrow tea (1-2 tsp dried yarrow tops or 1/4 cup fresh plant infused in 1-2 cups hot water) This simple treatment helps your body clear the infection and induces sweating and increases urine flow. High blood pressure, acts as a circulatory stimulant & blood purifier. In rheumatism, gout and arthritis. Contra-indications; prolonged use can cause photosensitivity. The volatile oil is not to be used during pregnancy as it can relax the uterine muscles. Not to be used in epileptic patients. Not be used by those who are allergic to the aster family of plants. 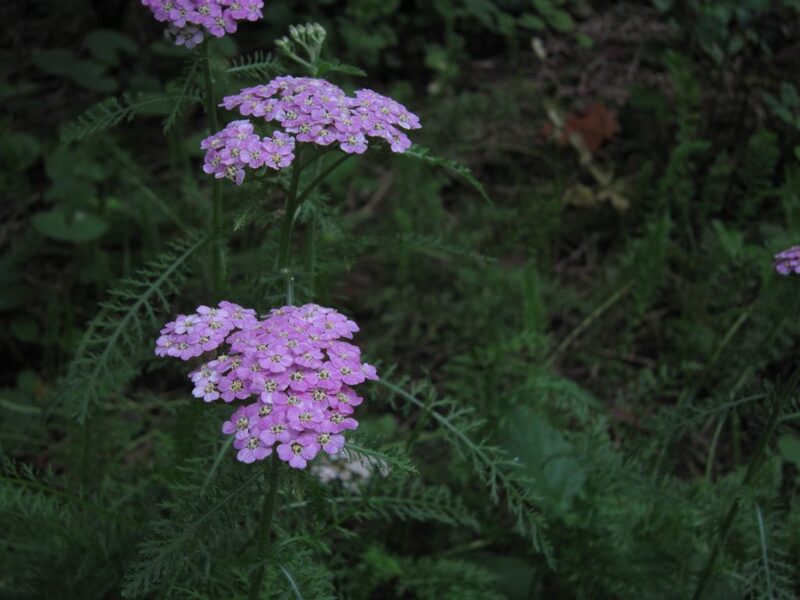 Gardening Applications; yarrow can be invasive, but is said to be an excellent companion plant by improving the health of plants growing nearby, as well as soil fertility. It will attract beneficial insects into the garden such as predatory wasps and ladybirds. Food uses; the flowers and leaves are used in the manufacture of some liquors, some european beers and herbal bitters.